Each lady has a different style of planning. One had an almost empty planner, but a tablet full of spreadsheets tracking everyone in her company and their travel and projects. Another, a librarian, had one of my favorite planners. It was a skinny bound book (of course it was, as she is a librarian), complete with a monthly view for appointments and travel, and simple, lined, horizontal weekly set-up for tasks and notes. Each explained why they plan the way they do. I was so proud of both of them. My girlfriends are smart, but even more important, they know themselves. Their planners reflect that. No matter how much advice I give here, the key to using a planner is to make it work for you - for your habits, temperament, and life. 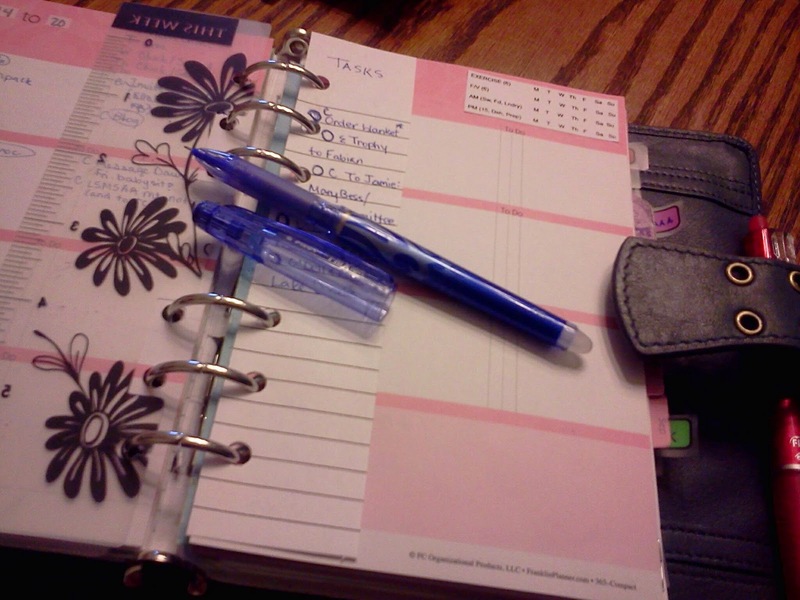 For me, weeklies are always the way to go for the meat of my planner. And Franklin Covey compacts are pretty portable, so the weekly/compact combination works. But after all the travel, I don't have enough room on one weekly two-page spread for what needs to be done next week. Still, my upcoming week isn't so busy that I need a whole extra page. With so much to do, I figured I'd share some tips for making a weekly spread capture extra information. *Use found space at the top of the page to menu plan. *Add a small piece of paper between the weekly spread so it doesn't hide the main tasks, but can list tasks that must be done this week, but on no particular day. *Write notes from the weekly tasks on the back of the small piece of paper. *Use the upper right corner to put a sticker with repetitive, daily tasks. *Write other people's tasks to track in the notes box at the bottom of the page. I would NEVER buy horizontal weeklies without a blank notes box. *Use the notes box for, well, notes. Mostly, I use the notes box for things like confirmation numbers when I book a flight, phone numbers/addresses of places I am going this week, or any information that occurs that I might need a record of later. These tricks make a weekly spread big enough. Any bigger, and I'd need a full-time assistant. Since I cannot afford a personal assistant, I won't be moving to daily pages. Hi, Giftie! 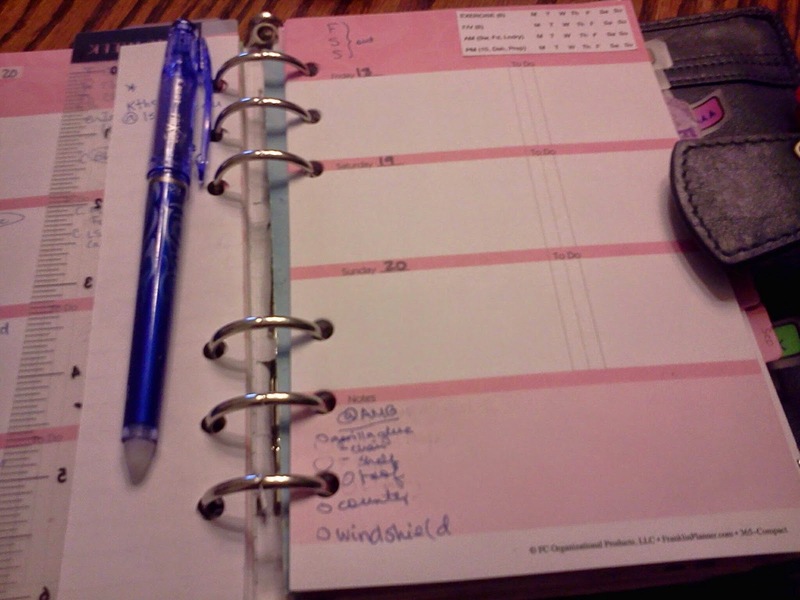 I really like using a weekly planner over a daily for planning. Plotting is done on the Daily planner page. I use a two-page spread with a notes section at the lower right side. Each day's meal (dinner only) goes on the last line of each day's section. If things get crowded, I use a sticky note and simply cover the day before or the day after. 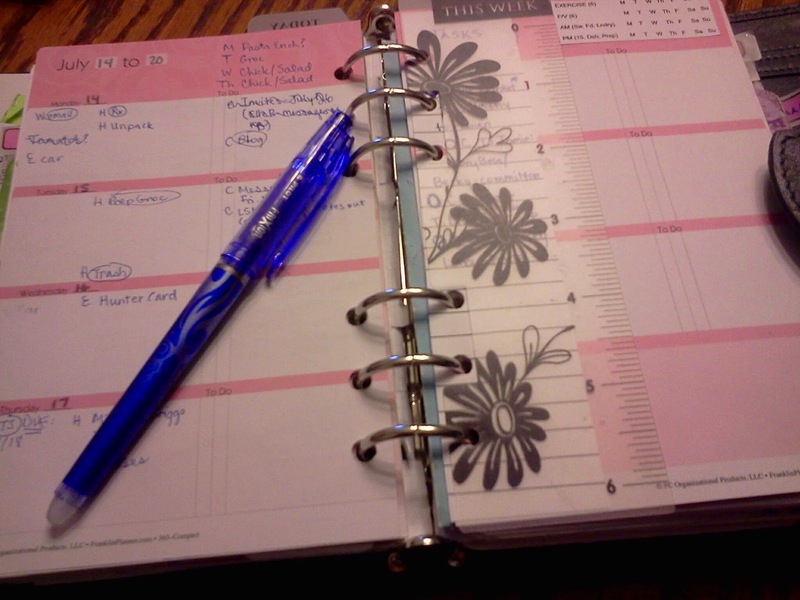 I use a meal planner in a separate binder so that I can also check the pantry and make my shopping list. Those paper strips you use for extra space are great! I am going to make a bunch of those out of notebook paper. Thank you for the great idea! Great ideas - especially the list in the center. I think the best thing you did here was NOT change your system because you suddenly had a week when you needed more. So often we have a knee jerk reaction and think we have to change our system because it won't work today or this week. Your strategy of modifying to make it work but not changing everything is perfect. Good job! First, thanks so much for your blog. I have been following for a while now - since I got my first Filofax in April - and have learned so much from your posts. A little ashamed to say that it took until now to finally comment and what prompted me to do so was the mention of Natchitoches! Just this morning I finished reading a novel called Cane River and Natchitoches is mentioned several times throughout the story! I am not a fan of IHOP though. I recommend the novel if you are interested in the area history, the Creole people in Louisiana and their transition from slavery.